Sprucecourt students react to their plays being read aloud by professional actors at YPT. As part of YPT’s Member Schools program, the grade 4/5 and 5/6 classes at Sprucecourt Public School worked with professional playwright Paula Wing to create their own short plays. The sessions focused on various aspects of playwriting, and each session culminated in a related writing assignment given to the students to continue developing their writing skills before the next visit. In May, the students came to YPT and saw their plays come to life through staged readings of their plays directed by YPT Artistic Director Allen MacInnis and featuring professional actors. Classroom teacher Carolyn Ball, and playwright and project facilitator Paula Wing discuss the process of supporting the students as they developed their short plays in Part One of this blog series. 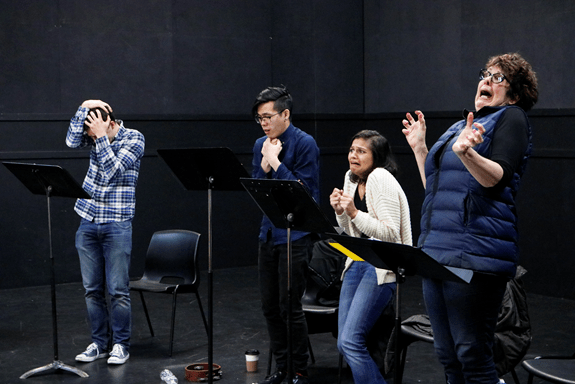 In Part Two, below, actor and YPT Resident Artist Educator Natalia Gracious shares her experience as an actor in the staged readings of the students’ work at the Playwriting Festival. As soon as I was asked to join the group of actors taking part in the Sprucecourt Playwriting Festival at YPT, I was eager to participate. As an actor who often performs theatre for young audiences, and also as a teacher who works with budding artists, I believe that having creative outlets is essential to a child’s development. Writing their own plays enables kids to express themselves, explore ideas and nurture their creative side all at once. I definitely wanted to be a part of that. When I received the scripts ahead of time, I was immediately impressed. Even though the student playwrights were young, it did nothing to detract from the sweet, funny and deep storylines that shone through. In fact, their youthful perspectives somehow seemed to add even more weight to them. For example, ‘Adopted’, ‘A Dream Come True’ and ‘The Land of Onyrac’ all featured broken families. In ‘Finding Devon’ a child mysteriously disappears from a park. These delicate and difficult stories being told through the lens of a child were always powerful, endearing and, at times, heartbreaking. As an actor my greatest challenge is making characters authentic. Throughout the rehearsal we were encouraged by Allen to stay true and genuine to the students’ words, and when taken at face value the words on the pages lent themselves to honest interpretations. I particularly enjoyed reading for Oopik, an Inuit girl stuck in an oppressive residential school. Her pain was so apparent; who better than a child to imagine and then articulate the terror of being wrenched away from home, family and familiarity at such a young age? The day wasn’t all heavy, though. One play that was particularly enjoyable was ‘Journey to the Goo Sea’ which featured as its main characters a salsa jar, a bottle of maple syrup and an eggshell. It was comedic, imaginative and immensely fun to perform. Even the more somber ‘The Journey to Mecca’ was livened up with the comedic appearance of a talking (and slurping) lizard! I wasn’t reading for the play ‘Prisonbreak’ and this enabled me to finally sneak a peek out at the audience. I’m so glad I got to see their faces! The students were extremely engaged, many of them beaming and all of them looking proud of their work and thrilled to be there. It made me appreciate how meaningful this experience was for them and I felt even more grateful for being able to participate in their big day. The arts are such a useful and important tool for the development of young minds, something that I am continually reminded of during my time at YPT. That being said, I didn’t take into account just how fun and enriching this experience would be for me as an artist, too! I’m so glad that the students got a lot out of the festival, and I am thankful to them for the wonderful journey…to Mecca, to the Goo Sea and beyond! For more information about becoming a YPT Member School, contact Aimee Bouchard, Member Schools & Education Manager at abouchard@youngpeoplestheatre.ca or by calling 416.363.5131 x216. Having fallen in love with acting at a young age, Natalia Gracious values the wonderful experience that theatre provides for children and is very happy to be a part of the YPT team. 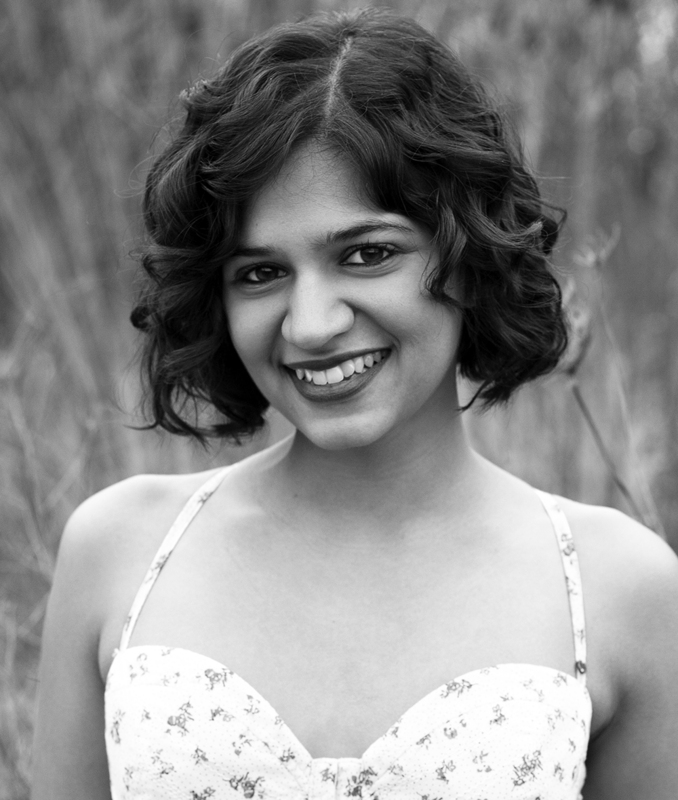 Past credits include Anjali in Beneath the Banyan Tree (Theatre Direct), Marcy Park in The 25th Annual Putnam County Spelling Bee (The Grand Theatre), Pepper in Annie (YPT), Sister Mary Leo in Nunsense (Harbourfront Theatre) and Felicity in Far From the Heart (Sheatre). When she is not performing on stage Natalia is one half of the YouTube comedy duo ‘No Funny Business Entertainment’, which you can enjoy at www.nofunbiz.com.